(From Nikon lens literature) The AF-S NIKKOR 200mm f/2G ED VR II, like its predecessor, is an incredibly fast aperture telephoto lens that incorporates Nikon’s Vibration Reduction (VR) II Image Stabilization system. The VR system provides up to four stops of correction to assist in creating blur-free images while shooting hand-held, or for when capturing D-Movie video content. Additionally, the NIKKOR 200mm f/2 VR incorporates an Internal Focusing (IF) system that allows movement of the optical elements within the lens barrel and does not change barrel length. Three focus modes are featured, with an A/M mode added to the conventional M/A and M modes. The optical construction consists of 13 optical elements in nine groups including three Extra-low Dispersion (ED) glass elements and one Super ED glass element that effectively minimize chromatic aberration, even at the widest aperture settings. Also included is a Tripod Detection Mode, which automatically compensates for minute vibrations when mounted on a tripod and allows users to keep VR image stabilization on and active – even when the camera and lens are mounted on a tripod. The 200mm f/2 is optimal for all types of shooting including weddings, portraits, sports, nature, and fashion due to its quick response and detailed lens design. 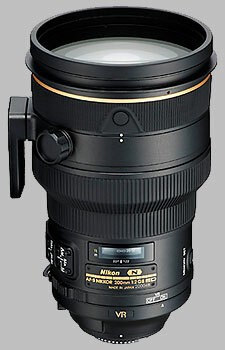 The AF-S NIKKOR 200mm f/2G ED VR II will be available early October for an MSRP of US$5999.95. There are surprisingly few thorough reviews of this legendary Nikkor prime. I was fortunate to find a "Used" lens recently refurbished by Nikon - with a 6 month warranty at half the RRP. Still a serious outlay but I've never regretted the purchase. I use it to back up my 300 f2.8G VRII and mainly for wildlife but also portraiture. I can confirm independent reports that the 200 f2G performs very well with TCE14 II and TCE2 III. As do nearly all current Nikkor tele primes (I can confirm the 300 f2.8G also couples very well with both these Nikon TCs). In fact, according to reliable reports and published tests, so do the G and E FL models of the 400 f2.8, 500 f4 and 600 f4 Nikkors (the 800 f5.6E has its dedicated bespoke TC). The 200 f2 is a stocky little handful but being quite short in its length, this concentrates the moment of mass when hand-holding (compared to the 300 f2.8G even though these primes almost weigh the same). The VR delivers. I use my 200 f2 on the Df and D500, and look forward impatiently to coupling this lens with the D850. But it is important to remember that focus can be tricky to clinch on more challenging (ie moving) subjects, but this is a weakness of the photographer not the optic! It is also a sound tactic to check and fine tune the AF to your camera(s). This is easier in the D500 (and apparently in the forthcoming D850). The 200 f2G VRII is one of the best Nikkor primes ever made. There is little more to say! Excellent image quality. Truly astonishing bokeh. Speed (T2). Lightning fast autofocus. Weight. Balance. Shape makes it a little more difficult to hand hold than it should be. One of the best lenses in Nikon's lineup. Sharp wide open, fabulous by 2.8, with an incredibly smooth rendition of out of focus areas. Plus, it has excellent transmissivity making it a true f2 lens: for this reason it is excellent when light is marginal, allowing quite more than the nominal stop of light versus the 70-80/200 2.8 lenses. It was my reference lens for image quality until I tried the Zeiss 135 Apo Sonnar. Still, it is an incredible piece of equipment. Of course, it costs an arm and a leg, it is a hassle to carry around, gets you immediate attention, and requires a clear commitment to its use... carry and use it for a day, and you'll want to drop it in a river in frustration. But it always, always gets back at least one amazing photo: as a tool, its fantastic. This is not a lens that is easy to hand hold for any length of time. A good monopod is almost mandatory. I recommend renting one if you can, before you plonk down the considerable amount this lens costs. The slip on Nikon lens cover is awkward; better to buy a Lens Coat "hoodie" or similar. However, if you want one of the sharpest lenses available, (some say it's Nikon's sharpest) especially wide open and want beautiful, dreamy bokeh then this lens has it in spades. A highly recommended but specialized lens.